Click here or on our card to enter into our Patient Rewards Hub! Points can be redeemed for fantastic prizes just click on our card above. Enter your 16 digit membership number or username on the back of your card and your 4 digit password. Once inside the hub, you can upload a photo, check your card balance, view messages or redeem for prizes. 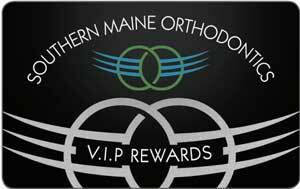 Southern Maine Orthodontics Patient Rewards Hub – It’s a fun place to be!